Arguably, the favorite genre today is the action adventure film. While many are formula and derived, some provide a true action experience. Air Force One is a true action film!! 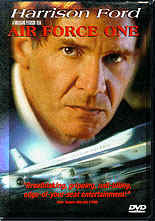 Harrison Ford plays the President of the U.S. aboard Air Force One with his family when it is taken over by terrorists. The lead terrorist, wonderfully played by Gary Oldman, will stop at nothing to have his recently captured leader freed. The action starts off at the beginning of the film and doesn't stop until the final credits are ready to roll. More than just action there is a good set of story lines that accompany this movie. The devotion the President has for his wife and daughter, the objection of his staff over his recent anti-terrorist speech, the political battle between the Vice President, Glenn Close, and the Secretary of State, Dean Stockwell. Even the smaller roles are cast with attention to detail. The film makes you believe you are aboard Air Force One. The tension is so real you can feel it. After some of the residents we have had in the White House, it may seem a stretch that the President should take on a group of terrorists single handed by Harrison Ford makes you believe. He plays the role that he plays so well and that only he can pull off in this manner, a reasonable man pushed beyond reason forced to survive by his wits. Glenn Close as the Vice President presents a strong woman in a troubled time. No mention is made of a woman as the Vice President, it just is. The role is for a strong person that can stand firm and trust in her President. It transcends gender. Gary Oldman is best at playing the villain in an over the top manner. You can easily accept him as the zealot compelled to do what he sees as his obligation to his cause. The talents assembled here elevate any film. Ford is, as usual, incredible. He nails the character of the President on the head. He commands the screen without the need to say a word. The audience can easily find it possible to believe that he is the President, the leader of the free world. To make this role work Ford had to flesh out the character. He has to be a real human being. The moments early on show him as a man of integrity, a loving husband and father, a leader but also a person worth knowing. Like his other more famous roles of Indiana Jones and Han Solo, his portrayal of the President is more complex than first viewing would lead you to believe. He is a man that can rise to unusual circumstances. Oldman is perhaps one of the best screen villains in thirty years. In contrast to the reasonable nature of the President, his villain is beyond reason. He is committed to a course he feels is justifiable and will use any means possible to achieve it. Even in the scenes where Oldman must provide expository material you can feel the anger just barely beneath the surface. Wolfgang Petersen is no stranger to action mixed perfectly with suspense and drama. His resume includes the classic Das Boot, Enemy Mine, In the Line of Fire, Outbreak and the more recent Perfect Storm. What all of these movies have in common is his control of the production. Petersen lays out the story so as to be perfectly timed. His pacing of each film is impeccable. In this film every scene adds to the moment. There is nothing wasted. The shots are framed so as to provide not only a focus of action but a rich background as well. The set for this epic simplifies the decisions required such as lighting. The plane is mostly well lit so Petersen did not face the concerns he had in such dark films like Das Boot and Storm. Still, the arrangement of action juxtaposed to plot comes off without a hitch. Technically this DVD is a masterpiece. The video is so clear you feel that you are watching the events first hand. The letterbox ratio is a nice 1:2.35, the way it should be. I had this movie on tape and it does not compare at all. In the Superbit version the extras included in the previous version like audio commentary by director Wolfgang Petersen are gone. This is a shame since that commentary detailing all the efforts that went into making this film the action was well done. Now for the sound. WOW!! If you just got a Dolby 5.1 system this is the movie to test it out. Use this one to demonstrate 5.1 to your friends and it is a sure bet that sales will be up in your local audio distributor. The take off of the plane hits you in the chest. The subwoofer pounds the aircraft's thrust as a visceral experience. The firefight where the terrorists take over the plane shows off each of the six speakers required by Dolby 5.1. Each speaker explodes with crisp, clear sound. Invite your neighbors to watch it with you since they are going to hear the film anyway. I watched this with a matched set of JBL speakers for front and back and it certainly tested them out for me. In fact, one hot summer with the air conditioner on the sub woofer pulled so much power to handle this film it blew a circuit breaker. All in all, this is one to get. You will watch it again and again. Harrison Ford does it again and does not disappoint in any respect.